You are here: Home / News / ARMA / If Peverel Retirement is admitted to ARMA-Q, what message does that send thousands of cheated pensioners? If Peverel Retirement is admitted to ARMA-Q, what message does that send thousands of cheated pensioners? 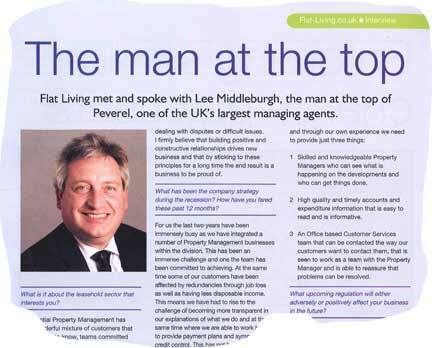 LKP January 2014: Should leasehold management companies that haven’t run a price-fixing cartel to cheat pensioners really sit down with Peverel / FirstPort in ARMA-Q? Ten months after being found guilty by the OFT of systematically cheating residents in retirement sites, Peverel Retirement is now lining up to join ARMA-Q. 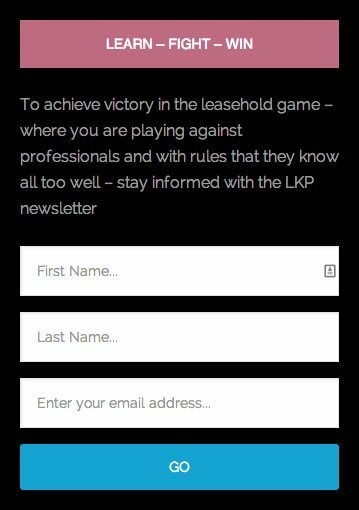 This is the new ethically enhanced membership scheme that ARMA hopes will demonstrate greater professional rigour in leasehold management. 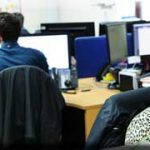 The announcement will be a shock for the ARHM (Association of Retirement Housing Managers), although Peverel will continue to bankroll this compliant trade body and remain a member. 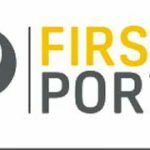 The open question is whether ARMA will take the shilling and admit Peverel Retirement, which along with the rest of the group is being renamed FirstPort. Or, insist on some weasely probationary arrangement. Or, the most reasonable response of all, tell it to clear off – as the ill-fated Campaign for Housing in Later Life did in April. 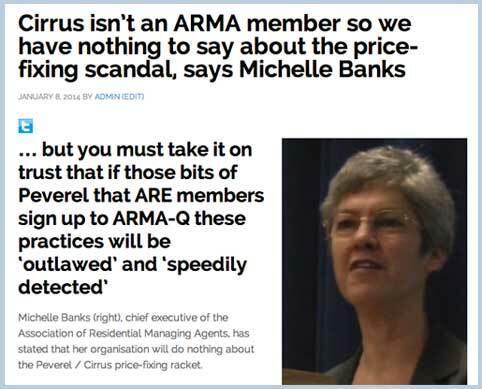 ARMA members who passionately believe in professional standards in their sector – and have faith in ARMA-Q as a significant step-upwards – will be aghast at the admission of the country’s most controversial – and largest – managing agent. Such is its pariah status that Peverel has been dropped by all major house builders, including Berkeley, Barratt and even McCarthy and Stone, which turned a small Hampshire estate agency into the management giant of today. After a string of controversies, Peverel was the subject of an OFT inquiry that established collusive tendering involving a bunch of stooge companies had won its subsidiary Cirrus contracts at 65 retirement sites. Displaying an invertebrate streak, ARMA chief executive Michelle Banks declined to make any public comment on the subject. 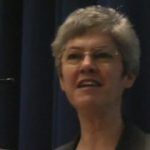 In January she wrote to a Campaign against retirement leasehold exploitation supporter: “We certainly do not condone the practices which led to an adverse ruling … [but] Cirrus is not and never has been an ARMA member. 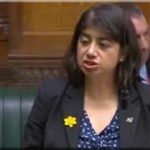 She added that under ARMA-Q “the practices on which the OFT has ruled will be outlawed, and much greater transparency will help to ensure that if they did occur they would be speedily detected”. That’s even more transparency, presumably, than the pellucid, crystalline versions promised so often in leasehold customer charters and similar. It was all rather feeble, compared with Sir Peter Bottomley publicly asking whether the authorities were aware of “possible unlawful or criminal behaviour involving Peverel”. The ARHM , which Peverel Retirement largely finances, said nothing at all until July, when it announced on careful reflection that it would do nothing either. It did not, however, have any qualms about accepting Cirrus as a sponsor for its summer annual conference. 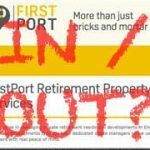 The restructuring with FirstPort means that the services division – Cirrus, Careline, Kingsborough – have been hived off from the property management. So it’s an open question whether ARMA-Q has “locus” or not over that lot. 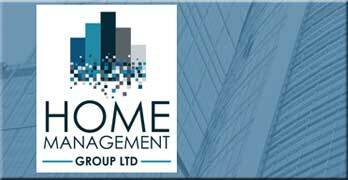 We are delighted to announce that all of our private residential property management businesses have submitted applications for ARMA-Q accreditation. ARMA-Q is the new self-regulatory accreditation for ARMA* members and aims to raise standards across the residential management sector – placing consumers at the heart of everything. ARMA-Q will ensure that ARMA members are complying with their Consumer Charter and bespoke Standards. All ARMA Q accredited members will be subject to a auditing regime and will overseen by an independent Regulatory Panel. Our retirement business has also applied to join ARMA and, in the near future, will submit an application for the ARMA-Q accreditation. 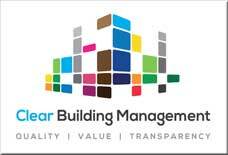 “We fully support the work of ARMA and ARMA-Q accreditation in helping to raise the standards across our industry. 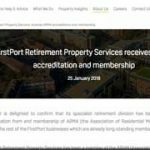 “I’m looking forward to our retirement business becoming part of ARMA, in addition to their existing membership of ARHM – this will mean all of our property management businesses will be ARMA members as we change to FirstPort over the coming months. 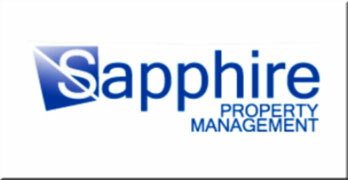 Retirement developments, by their nature are far more specialised than standard developments. I am not convinced that in its current form ARMA-Q covers the specific requirements unique to retirement living. That said, it would be pointless for Peverel to be a member of both ARHM and ARMA. So if admitted, i would expect Peverel to resign from ARHM (followed shortly by ARHM’s liquidation. Despite the past history of Peverel, I would expect ARMA to accept Peverel’s membership (if only out of financial self interest). 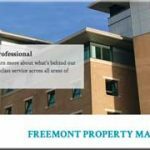 Indeed they have welcomed with open arms, Freemont, whose directors were heavily involved with Peverel during the price fixing scandal. 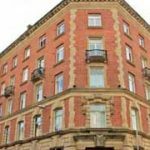 The admission of Peverel, could completely undermine ARMA-Q, and would be of grave concern to both leaseholders and the many honest property managers that subscribe to it. It would not be helpful if Peverel were admitted to ARMA, whilst the legacy issues raised by the price fixing scandals are not fully resolved. So, given the reputation that Peverel has, may i suggest the following before they can be admitted to ARMA? All price fixing issues to be fully resolved. 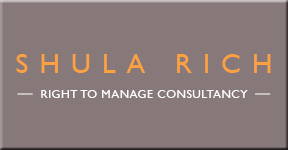 All management contracts to be produced to ARMA to show they are current and in force. 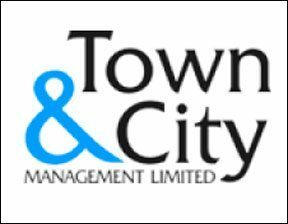 A £1m bond to be lodged with ARMA, in a protected account to be used to resolve legacy issues. A guarantee, that compliance applies to all Peverel Group companies (even those that strictly speaking are not members. Above all it shows the ways and methods used by Peverel Management Services Ltd how they take advantage of pensioners who retire and look forward to peace and tranquillity. Instead have to fight against this Tyrant Company that has been allowed to behave openly and uncaringly, using the very people that they purport to care for as seen on the front of the terrible magazine from Peverel Retirement. The magazine carries 33 adverts which must bring in a lot of money but are seen as a Cash Cow which is purely to raise money for the Peverel Group. We were informed by our Area Manager that part of our Managing Fees go into production of this magazine. I had a meeting with our Area Manager on Thursday, he arrived on site at 9.00 am and had a meeting with our Freeholders to discuss the building of an office on site which would release the House Managers Flat. Peverel Services Ltd, (are far as I am aware) do not own the Freehold but have an 125 year lease using another Peverel Services Company, Meridian who are the Lessor and the Landlord as well as the Managing Agent. I have met with the Freeholder and spoken to the Financial Director before he moved on. I find, the company has been very good and has been open and transparent with me, unlike Peverel Retirement who are a disgrace. Not only did the Area Manager fail to make the 10.00 am appointment, he was no more than 20m away and he did not bother to say he was running an hour late, typical. He could have called on the Warden Call System (that he states is free) which costs us a Line Rental Charge and an Insurance costing £19.50 a month which was never consulted about or asked for. I asked about our long running Insurance Claims where he used the Insurance Cover of Subsidence and Storm, and Flood Water to refuse a simple claim for £702.27 for a leaking WC and Damaged Carpets. After 5 years of asking it turns out that all the correspondence was verbal and he never placed the claim with Kingsborough Insurance, who sent me print outs which confirm no claim was ever made. I asked the Area Manager about Ashbrook Court being involved in Price Fixing, where he replied, not me Gov, that was the Manager of Cirrus Communications and Technical Manager of Peverel Management Services Ltd. 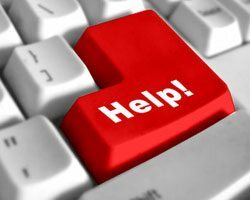 The AM admitted that he never kept written correspondence with Cirrus Communications when we were informed that the Warden Call System (WCS) was OBSOLETE, a £20,000 replacement was agreed verbally between our Area Manager, Peverel Management Services and Cirrus Communications. No report has been seen which determines that not only was the WCS OBSOLETE, but when damaged in a Lightening Strike, no report was ever seen, that stated the level of damage that had occurred. It took 9 months for the new system which was Up-Graded, to be replaced. 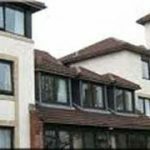 The two contractors used by Peverel were in collusion and were found guilty of Price Fixing, some 65 Retirement Developments, at a cost of £1.4 million. We at Ashbrook Court believe we were part of this Scam and the model found by the OFT was identical to the model we found had been used by Cirrus and Peverel Management Services Ltd. I put this again to the Area manager who again stated not me Gov, I knew nothing of the goings on at HQ, I aske if he was aware that the contract that was won by Cirrus Communication was in fact sub-contracted to Glyn Jackson the defeated other contractor that was finned £27,500 by the OFT then placed its self in administration not paying a penny, not me Gov. This same company Glyn Jackson was back at Peverel Retirement this year, undertaking sub-contract work for Warden Call System’s /Fire Systems under an other name. Would you believe this is possible and Peverel Services are ready to join ARMA-Q leaving ARHM, could a fiction writer make this up. I asked our Area Manager to bring the Invoice File for last year, still waiting even though he visited my flat on the 23/10/14. A phone call I just received at 12.35 today, informed me that the Invoice File was posted to the House Managers Flat, last week. Since the House Manager left on the 26/08/14 and the Invoice File would not fit in the Letter Box. Previously the Invoice Files were delivered to Denehurst just 300 m away and I would then pick them up. 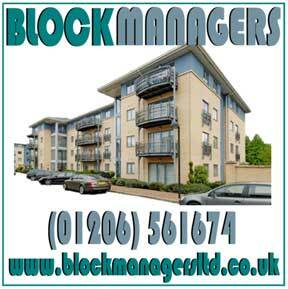 The House Manager at this development has not been undertaking the full House Managers functions since April 2014? 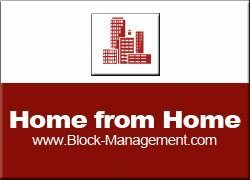 Why are the government not making regulation mandatory within the whole of the leasehold sector?Because most of the individuals who run these companies bank role them! The people at the top of ARMA & ARMHQ are not being independant in their dealings with rogue operators and I think they should be investigated. What a scam and a sham all this is…. This will all come back to bite some government at some point in the future, when buyers just stop buying retirement falts because of all the bad publicity and high management costs. 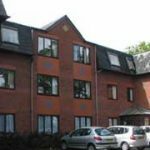 I am a resident at a Peverel Retirement property (Redlin Court, Redhill Surrey) and I am entirely in agreement with your contributors who feel let down and deceived by Peverel Retirement claims to provide pensioners with peace and tranquillity. For example the property I occupy have thin walls without the least noise insulation and the smallest noises from other residents would be heard by other near neighbours. I have often been falsely accused of loud music and noisy TV listening! This came about after I stopped contributing cash to funds for the previous house manager! I am only interested in recovering my health and having an enjoyable retirement. 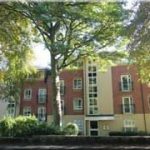 But with Peverel Retirement Management this does not come into consideration – all they want is that we pay the Ground Rent – which been doubled two years after I moved in and is collected now by a different branch located in Central London. The Service Charge is still collected by the Peverel Retirement Services Centre. 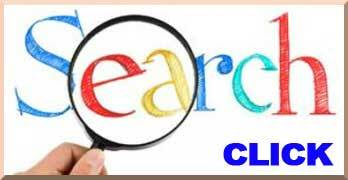 Thanks for providing us Peverel Retirees with a platform for comments. 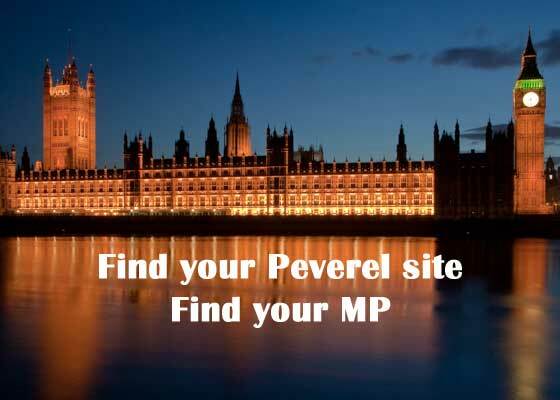 LKP / Campaign against retirement leasehold exploitation has published a very nearly full list of Peverel’s 1,467 retirement sites with links to contacting the constituency MP. 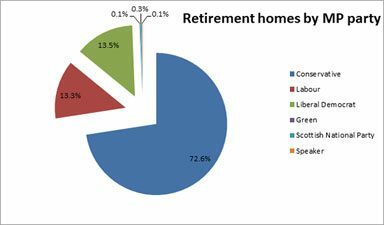 One feature that is immediately noticeable is that 73 per cent of retirement leasehold sites are in constituencies with Conservative MPs. 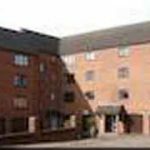 In an extraordinary admission, Peverel / FirstPort says it has paid over thousands of pounds of contingency funds at Hillside Court, Ormskirk, to the landlord “by mistake”. 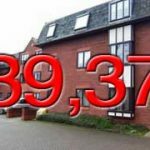 Residents estimate that up to £40,000 is at issue, involving the one per cent contingency fund fess payable on sale of the properties.